At the ALA Annual Conference in Chicago, the American Association of School Librarians revealed their list of the Best Apps for Teaching & Learning for 2013. While many of these apps might be best used with school-age audiences, many of them have terrific early literacy potential. Take a look at the complete list of 25 apps in 5 categories (books, STEM, organization & management, social sciences, and content creation), then let use know how you already use or envision using the apps–be it in storytime, another program, in-branch devices, or your own device. 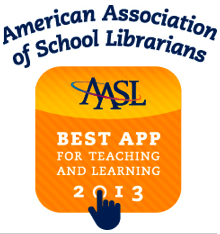 Posted on July 5, 2013, in Apps and tagged AASL. Bookmark the permalink. Leave a comment.